Crisply sweet, richly dry. Kumquat, cocoa nib, vanilla, allspice and molasses in aroma and cup. Bittersweet in structure with brisk acidity; full, satiny-smooth mouthfeel. The finish simplifies, though resonates pleasantly with both tart and rich elements. Produced by Juan Peña of Hacienda La Papaya entirely from trees of the Typica variety of Arabica. This is a wet-processed or “washed” coffee, meaning the fruit skin and pulp were removed from the beans immediately after harvesting and before drying. Founded in 1990, Lexington Coffee is an award-winning artisan roasting company based in Virginia. Lexington’s focus on fresh, flavorful and sustainable coffee is reflected in its motto, “Fresh, Flavorful & Fair.” Visit www.lexingtoncoffee.com or call 800-322-6505 for more information. 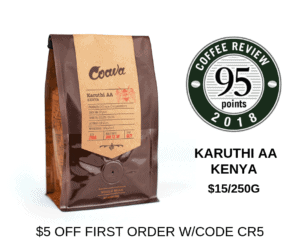 The Bottom Line: An aromatically bright and rousing Typica cup, high-toned with bittersweet citrus and rich spice notes.